Some of the first things that come to mind when people think of Wisconsin: Beer, cold winters, and cheese—but did you know that the natural wonders of the state are among the most beautiful in the nation? From sparkling waterfalls, to majestic bluffs, and scenic state parks, these 15 hidden gems are some of the best in the state. Between the Bayfield Peninsula and heart of Lake Superior lies the historic Apostles Islands, which is Wisconsin sanctioned islands. There are 21 islands and 12 miles of shoreline. Visitors can be amazed by the beautiful sights of the lake, lighthouse, and stay active by canoeing, hiking, paddle boarding, and sailing. The Apostles Islands are particularly beautiful in the winter. Cave of the Mounds is a naturally created limestone cave creation located in Blue Mounds, Wisconsin. Tours are available for visitors to check out the safe sections of the caves. Lights illuminate historic stalagmites and stalactites throughout the cave. Niagara Escarpment is an arc-shaped rock ridge formation spanning almost 1,000 miles in length—majority does not lie within Wisconsin domain. We are still able view its beauty from Waukesha County to Door County. Big Manitou Falls is a waterfall located in Pattison State Park. Manitou Falls is the fourth highest waterfall east of the Rock Mountains towering 165 feet in height. There is a small sister waterfall names Twin Little Manitou Falls on the same premises. Governor Dodge State Park is among the largest in the Wisconsin Park System encompassing hills, heavily forested areas, bluffs, valleys, and a waterfall. It is located within the state’s drift less area. Make a weekend out of this timeless excursion by visiting this hidden gem. Located in Menomonie, Wisconsin, view the power of nature and witness one of Wisconsin’s wonders. The Devil’s Punch Bowl is a rock formation in the shape of a bowl. Get a view from the top looking down, or the bottom looking up. It is particularly a sight to see in the winter time with the water is frozen over the rock. The Chequamegon-Nicolet National Forest snakes around northern Wisconsin covering almost 1.5 million acres. The size of the forest is amazing in itself, the area offers hiking, valleys, water ways, and heavily forested areas. Willow River State Park adds another great waterfall to Wisconsin’s resume of hidden gems. Water activities are allowed to be enjoy the area in the summer months. Swimmers are often spotted enjoying the small waterfall and snapping breathtaking pictures of the area. Grandad Bluff Park located in La Crosse showcases some of the most beautiful bluffs in Wisconsin. Its notoriety does give it some popularity among travelers so the park system decided to build a resting area atop for even more spectacular views of both Wisconsin and Minnesota. Devil’s Lake State Park is among one of the most popular areas of Wisconsin’s hidden gems. Quartzite bluffs overlooking the striking Devil’s Lake located in Baraboo, Wisconsin. Camp, swim, and hike one of southern Wisconsin’s most favored areas. The most interesting thing about Copper Falls State Park is that it encompasses sections of the Bad River, which flows conveniently through a gorge and drops down over several waterfalls within the park. The views are so surreal and photos are picturesque. 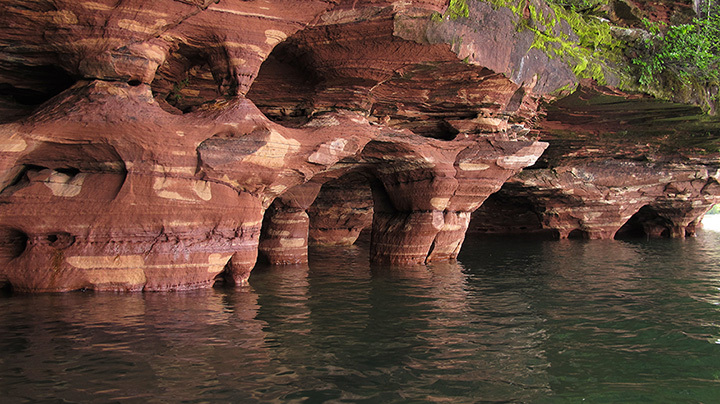 View a natural sandstone arch formation located in Leland, Wisconsin. Wisconsin’s own hidden arch way tucked deep within the Natural Bridge State Park. The effects of erosion from both wind and water etched out this 25-foot-tall by 35-foot-wide opening. Cave Point County Park features stunning underwater caves, challenging hiking trails, and limestone cliffs. The cliffs border both the town of Sturgeon Bay and Lake Michigan. View cliffs as high as 200 feet and view parts of the Niagara Escarpment. The town of Minocqua is a perfect get away town for any time of the year. Lake Minocqua, Lake Kawaguesaga, Lake Tomahawk, and Mid Lake give life to his unincorporated town. Great fishing, ice-skating, swimming, boating, and other water activities on this lake chain make it a well-kept hidden secret. Timms Hill is the highest natural point in Wisconsin. The elevation almost hits 2,000 feet. Timms Hill is located in the southeastern region of Price County, Wisconsin. Timms Hill is heavily forested with wooded area and is especially beautiful in the fall.